If there’s one thing you can count on when Republicans control one part of government and Democrats control the others, it’s that Republicans will force a government shutdown. We saw it in Congress in the fall of 2013 when John Boehner shut down the federal government in an attempt to defund the Patient Protection and Affordable Care Act. We saw it in California in the summer of 2008 when Republicans blocked passage of a state budget for nearly three months past the constitutional deadline. And now we’re seeing it here in Washington State. Republicans claim that the problem is with the Democrats – but the facts show otherwise. 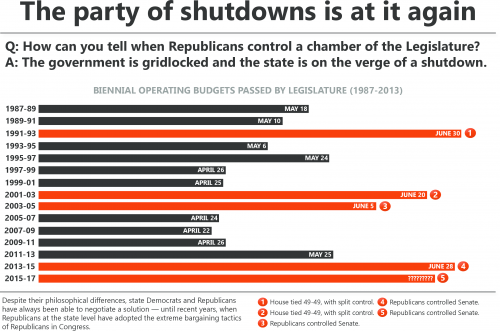 This graphic, created by a friend of the Northwest Progressive Institute, shows that the Washington State Legislature has routinely had difficulty reaching agreement on an operating budget when the State Senate has been controlled by Republicans, or when Democrats had to share control of the State House with Republicans. For nearly the last 30 years, the pattern is clear. When Democrats control both chambers of the Legislature and the Governor’s office, state budgets are completed well in advance of the June 30 deadline. But when Republicans have partial control, whether a 49-49 split in the State House or a narrow State Senate majority, they turn to extremist tactics. Rather than negotiate in good faith, they prefer to use Democrats’ desire for good government and their aversion to hurting people who would suffer from a government shutdown as leverage to get their way. The lessons from California and from Congress are clear: the public needs to be rallied to oppose these awful Republican tactics. 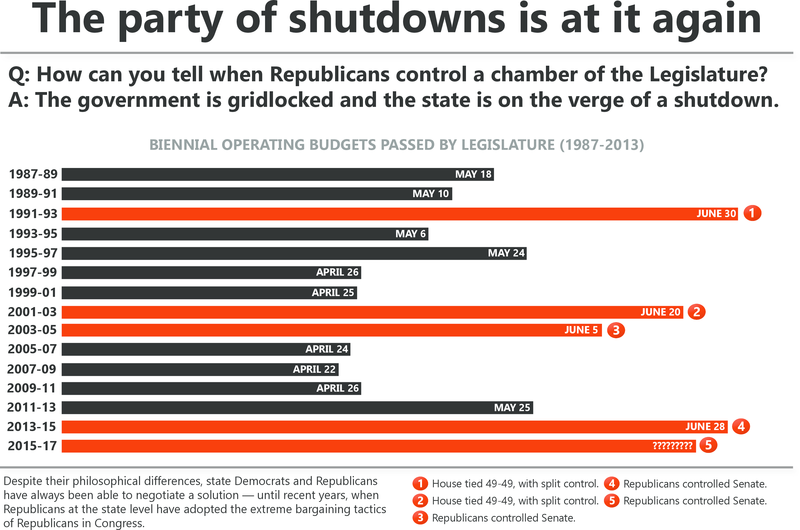 And at the next election, voters need to be reminded that it’s Republicans who have a history of threatening shutdowns in Washington State.